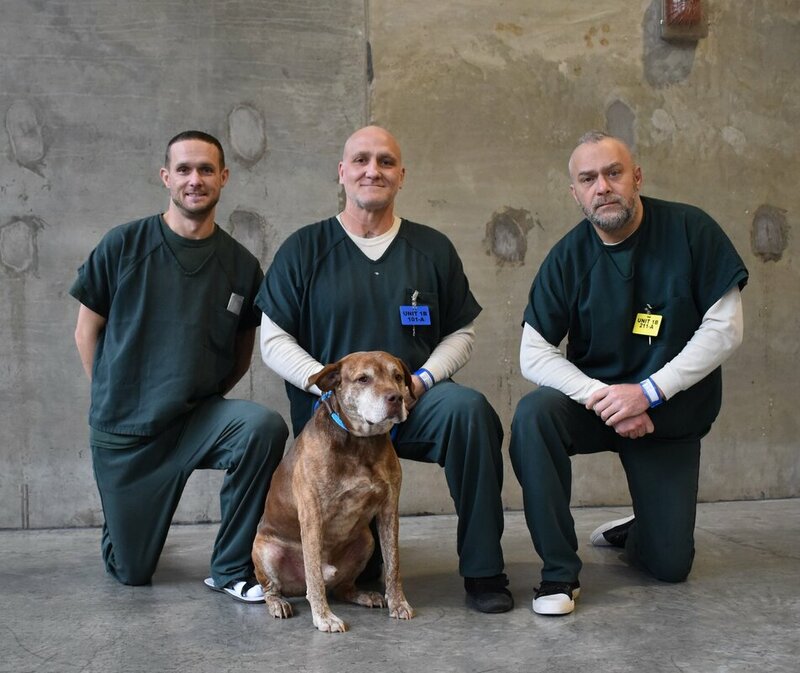 ﻿﻿﻿﻿﻿﻿﻿﻿﻿﻿﻿﻿﻿﻿﻿Adopt a Dog: Please fill out an application at https://www.jaildogs.org/application.html and note the dog you are interested in. Please note in your email "Jail Dog" in addition to the name of the Jail Dog you are inquiring about. Adoption Fee: Only $200, unless otherwise noted. This includes all vetting, spay / neuter, and all the training the dog has received while in our program!!! Thank You so much to all of our generous Sponsors! You make what we do possible. Sponsors receive recognition on the website, our Facebook page, and when their dog is adopted they receive a Certificate of Completion. Click here to Sponsor a Jail Dog today! We gratefully accept multiple sponsorships per dog. All sponsorship money goes directly toward the care, feeding, medical needs, and supplies for the dogs. Thank you!!! Bandit gets along with other dogs and would love to have some fur siblings of his own. He loves to play with his toys and run around off of his leash. Bandit loves tennis balls and playing tug of war with just about anything. He is a special needs dog so he will need someone that will be at home with him at all times. Bandit does not let his disability slow him down, it actually speeds him up. He can get up to high speeds in his wheel chair and acts like any other dog without a disability. Bandit will bring so much love to your home and make your life a little brighter. Sweet lovable Bella is ready for the next chapter of her life. She was pulled from a local shelter where she spent months waiting on someone to come and make her their very own. Bella was taken into the Jail Dog program where we have found how very intelligent, loyal and loving she is. She would do best with a family that is familiar with the German Shepherd breed and possibly as your one and only furry family member. We are very excited to see what the future holds for this wonderful girl and would love to see her in a home environment very soon. Meet the happiest girl to have become a Jail Dog! Brizzie was rescued from a local shelter and is now enjoying all the love and attention she is receiving from her handlers. Brizzie is a very sweet girl that does well with other dogs and loves to play. She is an active young lady that would love a family that would include her in family activities. Bud loves people but would be best as an only dog. He loves playing with sticks and chewing on bones. Bud would do well with a large backyard. He loves to howl when he hears sirens and noises outside. He can be energetic. He gets along with some dogs, (females better than males) but can be very dominate. He loves to play with a ball and is very treat motivated. He is a quick study and knows basic commands such as sit, down, relax, stay, come and shake. Scruffy little Buster is one adorable guy! He has warmed his way into our hearts after only a few days into the program. He is eager to please and loves belly rubs. Buster is working diligently on his basic obedience and is a quick study. This little guy would be a great apartment dog due to his size and laid back personality. Cedar is one very handsome boy. His coat is a light copper color and his eyes are a gorgeous hue of hazel. He is quickly picking up his basic obedience and loves to please the person that has the treats! Cersci is an adorable shepherd mix that was rescued from a local shelter. She was under weight, her coat was very brittle and she was just not the happy go luck girl she is today. We have been so happy to see the wonderful transformation in this girl and can't wait to see what the future holds for Cersci. She is still just a young girl so someone that will continue the rules, boundaries and limitations she is learning at the jail would be wonderful. If you are interested in adopting Cersci please fill out an adoption application today! Cleo is coming out of her shell since arriving last week and we are so excited to see what the future holds for this adorable little girl. She is shy and timid when meeting new people, but she warms up quickly and is very food motivated with the right treats, (she loves jerky treats!!!). We would love to see her go to a home where she can enjoy a life filled with love and pampering. She would do best in a home without small children due to her fear right now. If you would like to give Cleo a chance and a new beginning please fill out an adoption application. Elvee came to us about a month ago very scared and in need of socializing. She has been working very diligently with her handlers and we think she is ready for her next phase in life. She is a sweet girl that loves to play and spend time with her person(s). She would do best with an experienced dog owner, not as a first time pet. There are so many wonderful things we would love to share about Elvee, so please fill out an adoption application today. Happy is the accurate name for this handsome boy. He is a high energy kind of guy that is looking for that perfect fit in a home. He does have a disability he was born with, but as you will see when you meet him, that doesn't slow him down one bit. He needs an experienced owner that will continue to give him the guidance he needs so he will be the awesome pet we all know he will be. Hugo used to be used as a temperament tester when he was at the animal shelter. While he was at the shelter before he was rescue by the Jail Dogs Program, he was attacked by another dog through no fault of his own. Since that incident Hugo has become dog selective. He is fine with low energy non-reactive dogs, but does not do well with dogs in his face. Who can blame the guy when he has been attacked in the face by a dog already? He is very lazy and laid back. Hugo would do well with anyone who could just chill with him. He loves it when people sing and dance around him. Hugo loves to give kisses and get belly rubs. He's so ready for a home of his own. Lady was returned by her adopter when they stated she didn’t do well with the young kids in the home. We are not sure what would have triggered that behavior because we have had her at off-site events when all she wanted to do was play with the children at the event. With that in mind, we would love to find Lady a home with an active family and children that are 12 years or older. She does well with other dogs and knows all of her basic obedience commands. Lady is smart and eager to please so don’t keep her waiting! Lee is a brindle colored pit mix with brown eyes. He can get anxious around new people and needs a leader in his new family. Lee knows basic commands: sit, stay, come, shake, down, crawl and even knows how to turn on and off lights!!! He is probably the best trained dog in the program at this time and would do great with a family that will continue giving him the rules, boundaries and limitations he needs to thrive. Liz is a playful and loving girl. Don't those big brown eyes make you melt? When she came to us at just 13 weeks old, she had a broken leg and was in need of surgery, but is doing great now!﻿ She is shy at first, but likes all people. She would do best as the only dog in her permanent home. She enjoys playing, eating, cuddling, treats, outdoor activities, and lots of attention. She'd make a wonderful family pet and is great with kids. Her handler says she has the cutest squishy face (and we agree! ), her ears flop over in the cutest way (totally do! ), she's super smart, and has a very outgoing, playful personality. Sponsored: In loving memory of Ranger. ​Want to Sponsor me too? ﻿﻿﻿Click he﻿re﻿﻿. Major has been a work in progress, but well worth the wait. He and his sibling Moonie, Maddie, Mille and Bane were all pulled from a local shelter after being found running stray together. They were all very scared and skittish, but with the love and dedication of our handlers they are ready to be adopted, (Moonie and Bane have already found their homes). Major is the biggest of the 5 and a very sweet boy. He has picked up his basic obedience very quickly and is working diligently on his house training. Rogue is a little scruffy guy that adores being paid attention to. His handler states that Rogue would rather be loved on than any toy or treat that is offered. Rogue can be found curled up in one of his handlers lap or being carried around the unit. This little guy is pretty awesome and we hope will go pretty quickly so please make sure to fill out an adoption application quickly! Need a beautiful blonde in your life? That's me, Roxy! I love stuffed animal toys, long walks, playing tug, and being loved on. I can sit, stay, come, and lay down. I'm pretty strong, so I'd do best in a house without small kids. My handler says I wake him up every day with the sweetest Roxy smile. She's wonderful with humans, but is not always comfortable with other dogs, so she'd do best as an only dog. Sponsored: Thank you so much Leah Gilbert for sponsoring me! Woof! Want to Sponsor me too? ﻿﻿﻿Click he﻿re﻿﻿. Sasha is beautiful! Those ears and her expressions will keep you smiling for hours. Sasha is the mom of Kane and Vulcan and is so ready for a family of her very own. She is smart, attentive and eager to please. Can't you just see this sweet girl in your home very soon? And the "eyes" have it, literally, just look into those gorgeous things!!! Smokey is a handsome guy that is eager to please and would be happy to be your next family addition. His handler says he has mastered his house training and is working very diligently on his basic obedience. Smokey is smart, and would love an active family. Tara is an energetic girl that needs an active family to keep her busy. She is very friendly and LOVES to play ball. Tara started training to become a companion assistant dog before arriving at the jail, but because she doesn't do well with small children, she was unable to complete her training. Tara would make an excellent running or hiking partner and would do well in a home with teenage children. She is eager to please and would love a home of her very own soon! Normally the words laid back and husky are never found in the same sentence, but we can inform you that Timber is exactly that. He doesn't have a care in the world and hasn't met a stranger or other dog that he doesn't do well with. Timber has some gorgeous piercing sky blue eyes that will melt your heart as he looks up at you for approval. For more information about Timber, please fill out an adoption application. Twitch is a little guy that is adjusting to his new environment, but is getting braver every day! His handler said that he wants to play with all the big dogs, but loves spending time with some of the smaller ones. This little guy would be a great addition to someone that lives in a small home or apartment due to his size.